As I write this, you can order Ganondorf, Zero Suit Samus, and Captain Olimar Amiibo on Walmart.com (Classic 8-Bit Mario sold out a few minutes ago). If you’re into Amiibo, we’ve got another big day for you today! Simultaneous with Mario Maker’s release, the next major Super Smash Bros Amiibo wave is releasing along with the 8-Bit Classic Mario Amiibo. 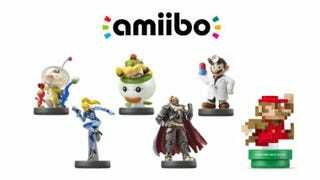 You will be able to get Bowser Jr. at Toys R Us ONLY. You will be able to get Dr. Mario at Target ONLY. For the exclusives, stock should be plentiful, so you should be able to show up at their respective stores within a few hours of release and pick one of these guys up. For the non-exclusives, the numbers are abundant but they are spread around at different retailers. Toys R Us will have the largest number of all of them per store. Other stores you can find them at include Gamestop, Best Buy, and possibly Walmart. Amazon.com is releasing them in waves every hour on the hour starting at 1PM PST. Just start refreshing the respective pages at about two minutes til and you ought to be able to get an order in. Target.com already had pre-orders, so it’s unclear if they will go up on the site again. Walmart.com started taking orders at about 10PM on September 10th. All but 8-Bit Mario are available as of Midnight on September 11th. They will be sold out before long, and Walmart does have a nice pick-up-at-store feature that I recommend if you happen to be up right now. It’s looking like this wave is going to sell out quickly. Classic 8-Bit Mario is the unicorn of this run, unfortunately. Ganondorf is second rarest, but has ample enough stock to be available for at least a few minutes on Amazon.com if you don’t happen to get to a store around opening. The rest have relatively high stock numbers and in some areas will last for hours (though in my area, the San Francisco Bay Area, they’ll likely all sell out before noon), but they are distributed across many stores. If you really want all these Amiibo, I recommend going to Toys R Us at least one hour before stores open. If you miss any, you have a second chance with Amazon.com’s afternoon order windows. The exclusives are going to be overfilling the shelves at their respective stores, so you shouldn’t have to wait in line if that’s all you care about (Dr. Mario is just what the doctor ordered, by the way). Recommended plan if you intend to buy them all and want to try to hit stores: Go to TRU at 9AM and wait, get one of each of the amiibo including Bowser Jr. Head over to Target and get Dr. Mario. If you missed any of them, go to Amazon.com at the appropriate time and grab the ones you missed. For my part, I managed to get the whole wave except Bowser Jr. and Dr. Mario ordered from Walmart.com tonight! I actually imported Dr. Mario a few weeks ago because I just love Dr. Mario (I played that game so much as a kid). So it was actually a pretty low key wave for me, personally. I also think for most people who are really into them, this wave should be pretty straightforward—I think getting them on Amazon in the first half hour will be pretty easy since Amazon’s entire allotment will go up at those times. But we shall see! Oh, and don’t forget to get Mario Maker while you’re at it! So, Amiigos, anyone else here planning to get any of the Amiibo releasing today?